Central location, nice pool and very helpful staff. Right in the middle of town and the pool was great! Andromeda is the perfectly located hotel in Mykonos town with very comfy and clean rooms and polite stuff. I would recommend .. we came back asap. The staff were awesome. Gave us lots of valuable info. We had a later flight and they stored our luggage. We were also allowed to cool off in the pool before our flight which was great. Would highly recommend. Location was center of main Myk town. But very bad to get to for baggage. Staff helpful by providing assistance with baggage leaving.. Perfect location in old town, with a beautiful pool too. Excellent breakfast as well. Very spacious room. Pool was excellent, with plenty of lounge chairs. Fresh sheets and towels provided each day. Everything was close by, without the noise of the pubs and clubs on the waterfront. Little Venice and the Old Port are an easy 10 minute walk. Would stay here again! We loved everything about this property! From the minute we checked in Jeannette and George could not be more helpful and friendly. Our family of 5 fit very comfortably in a multi level 3 bedroom townhouse. Staff so attentive! Wonderful pool area, so quiet and relaxing. Great breakfast included , served poolside! Great location in downtown , minutes from all the great shops and restaurants and bus stop to beaches. Would highly recommend! Upon arriving at the hotel, Jeanette welcomed us and greeted us very nicely. She explained details about the hotel and also what to do around the city. The room was nice, complete and clean towels everyday and also clean bedsheets everyday. Our kitchen was equipped with what we needed. The hotel was just minute away from the center which is really close to everything. The pool was nice unfortunately we didn't get the chance to swim because of the weather. The rest of our stay was all pleasant. Lock in a great price for Andromeda Residence – rated 9 by recent guests! One of our top picks in Mikonos.Andromeda Residence is just 2 minutes’ walk from Mykonos Town center, famous Matoyannia and Little Venice. Set within a peaceful courtyard, it features renovated apartments with free Wi-Fi around a swimming pool. The Andromeda complex includes six 2-story buildings consisting of studios and two-story apartments. All units are equipped with air conditioning, self-catering facilities, free Wi-Fi and an LCD TV. Each unit enjoys its own balcony or patio and independent entrance. Some feature a lounge area with sofa beds and a desk. Each morning guests can enjoy breakfast by the pool. In the evening the pool bar offers drinks and snacks with views to the illuminated pool. Only 500 feet from the bus stop, guests enjoy easy access to Mykonos’ sandy beaches. Andromeda is 1.9 mi from the new port and less than 0.9 mi from the old port. Mykonos Airport is 1.6 mi away. This property also has one of the top-rated locations in Mikonos! Guests are happier about it compared to other properties in the area. This property is also rated for the best value in Mikonos! Guests are getting more for their money when compared to other properties in this city. 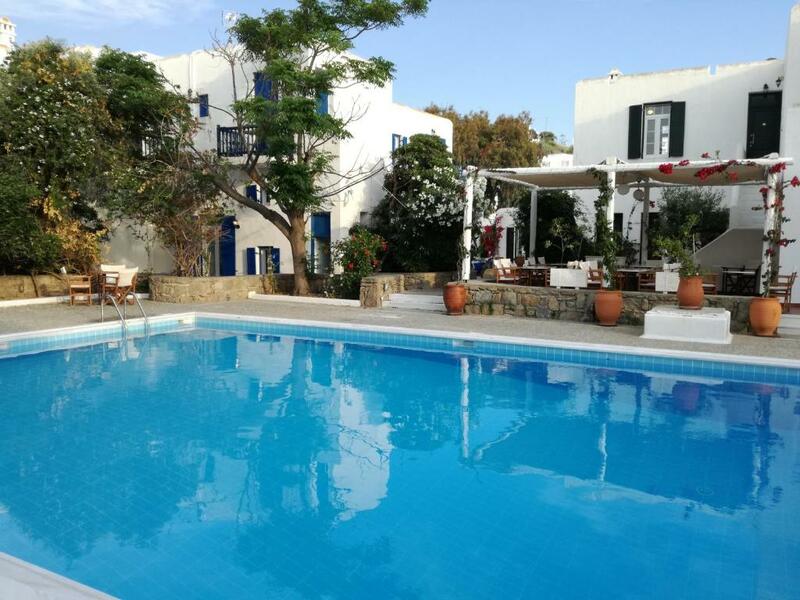 뀐 Located in the real heart of Mikonos, this property has an excellent location score of 9.7! When would you like to stay at Andromeda Residence? Cycladic-style studio with equipped kitchenette. It has pool or garden view, and free Wi-Fi. Room size may be different and varies from 22 to 98 ft², subject to availability. 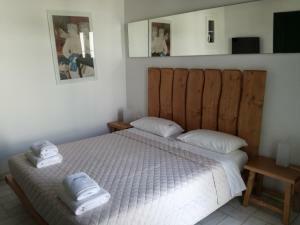 Large apartment with a fully equipped kitchen, free Wi-Fi, seating and dining areas. Two sofas that can be converted into bed is featured in the living area. Room size may be different and varies from 35 to 148 ft², subject to availability. Spacious maisonette with a fully equipped kitchen, a living room with sofa bed, and a dining area on the main level. An internal staircase leads to the loft bedroom on the upper level, while the master bedroom is on the lower level. It also has 2 bathrooms, one on the main level and one on the lower level. Free WiFi is offered. Please note that this unit has a lot of stairs, therefore it is not recommended for really young children and for guests with mobility issues. Opening to a private balcony, this apartment has a living room with sofa bed and a separate bedroom with double bed. It also includes a fully equipped kitchenette with a dining area, as well as air conditioning, a flat-screen TV and a hair dryer. It can accommodate up to 3 people. Please note that this apartment is located on an upper level and has an internal staircase. 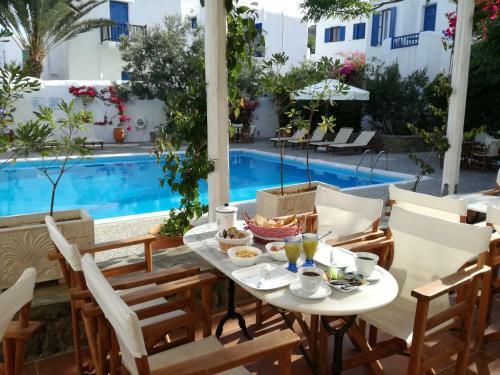 The Andromeda Residence hotel complex is ideally located within a traditional neighborhood of Mykonos Town. Guests can relax at the pool area which offers sunbeds and umbrellas, table and chairs for snacking and wifi hotspot, as well as a pool bar for snacks, beverages and cocktails. Complimentary wifi is offered through the hotel complex. As we are located in Mykonos Town, everything is within walking distance of the hotel. The cosmopolitan shopping area of Matogianni Street with all of the well known designer clothes, jewelry and popular arts and the cafes, taverns, restaurants, bars and the famous lively nightlife of Little Venice and Mykonos Town are all less than a 5 minute walk from the hotel. The central bus stop and taxi station of Fabrika Square is walking distance from the hotel. There are frequent scheduled buses providing easy access from Fabrika Square to the famous party beaches of Super Paradise and Paradise, as well as many other beaches. House Rules Andromeda Residence takes special requests – add in the next step! Free! One additional child under 2 years stays free of charge in a crib. Andromeda Residence accepts these cards and reserves the right to temporarily hold an amount prior to arrival. Please inform the Andromeda Residence of your arrival time. Room was up one flight of stairs,( which is a bit of a struggle for us both) however, was offered to move to lower floor after 1st night, we we declined as still great room. Is all nice, perhaps breakfast could do with some more love... Anyway, you are just few steps away from bakeries and other places where to satisfy your breakfast needs. The locations is great, also it is quite nice being on a very calm and quiet slice of the town. Staff is very helpful and apartments very comfortable and clean. Swimming pool looks lovely although due to bas weather we could not get the best out of it. Excellent location. Good breakfast. Helpful staff. Great location close to the heart of Mykonos City - just a short walk to bus services but also the wonderful restaurants which are abundant. The pool area was really lovely and a great setting in which to enjoy the included breakfast every day. We were really happy with our stay here and would recommend it to others. They included a baby cot free of charge which was very much appreciated. When you arrive in this residence you feel at once part of a family. Our room was superclean and superquiet, breakfast was huge and very good. Location is simply terrific , being right in the centre of Mykonos town, 10-15 minutes by walk from the most distant attraction and 3 minutes away from the closest free parking. Its strongest point is the staff, Jeanette is awesome so as the kind lady serving you breakfast and the cool and the 2 handsome handyman guys that work very hard to make you stay wonderful (rooms cleaned everyday so as did the swimming pool by a guy always ready for a smile). I highly recommend this residence to make your holiday worth it. We definately would come back here! Thank you Andromeda staff! It is not easy to access the hotel for a first time visitor, but once you know your bearings everything falls into place. The location is very close to everything. The apartment was spacious for the five of us. The two shower facilities and toilets in the apartment was very ideal. Very friendly and assistive reception desk personnel s. They directed us on what to see and where to eat, this made it easy to navigate our holiday without wasting time. Don’t stay in this area of town if you can’t get your luggage up and down a long steep hill with uneven paving as cars are not allowed into the area, however, the staff did assist us when leaving. Many steep stairs inside the apartment to the upstairs and downstairs bedrooms. Unable to stand up in the upstairs loft/bedroom. Pool area was nice and hotel was clean and close to restaurants. Hotel required prepayment, then credited you when you arrive and recharged! A nightmare is you changed the original credit card! Rooms are sparse, no chairs, no safe! They advertise a pool bar that is not open??? No shower curtain in the bathroom. Great friendly staff. Very nice breakfast. The atmosphere at Andromeda is positive. Comfortable beds. Amazing swimming pool and hotel. Nice home-made breakfast ! Private terrasse. Big room with enough space for 3 people. The employees took care of us because of the boat strike and they managed to find a solution for us. Thank you ! It was amazing. Breakfast was extremely simple - boiled egg in a basket of bread with optional fruit. Bed mattress was tough, ashtray in room-it was a smoking room and it should never allow smoking because I am allergic to residual smoke. Hotel should provide walking instructions to the hotel ahead of the visit, as Google maps takes you through a long 900 mt road where a 200 mt walk would have been faster. Electric plugs are very limited. Very friendly staff, explained local information and helped us with a pre checkout process and even gave us the breakfast ahead of the early checkout day (6am). Room has kitchenette, dishes, hot water pot. Good internet.